1.Eco-friendly materials. made of 100% Polyurethane(phthalate free),not poisonous PVC or cheap rubber. 2.Perfect weight not too heavy or too light for kids to play. 3.Bounce well, bright rainbow color and soft material. 4.Never getting hurt or made too much noise when bounce it. 5.Foam basketball not a air filled basketball so that do not need worry about air leak problem. 6.Work well with trampoline hoop set. 8.Perfect toy gift or present for 3+ years old toddler. ✓The lovely color is eye-catching to children, soft feature to protect kid from getting hurt. In addition perfect for kids to learn basketball basics skills such as dribbling, shooting and passing. ✓Bounces well and quietly. It does not leave any marks on the wall, carpet or hardwood floors. ✓The foam basketball is lightweight ,does not made thud or loud noise in the house and do not need worry about your kids break things. ✓Worked perfectly with indoor mini hoop, trampoline basketball hoop, the door hoop, mini hoop set. If you are not satisfied for any reasons ,simply return Chastep Rainbow Basketball for a FULL REFUND in good condition with NO Question Asked. Our mission is to offer you the best quality foam soccer ball in the market and contribute every day to the satisfaction of our customers. We have established our factory since 1998. We really hope bring a lot of fun to you and your kids. If you had any questions please kindly contact with us. GOOD WEIGHT. 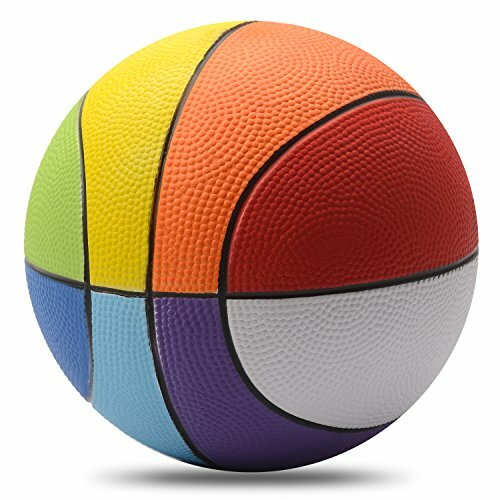 8 inch foam rainbow basketball,not too heavy or too light to play, recommended for kids age 3+.Perfect gift or present for kids and toddlers. PRACTICE COORDINATION EXERCISE. Perfect for parents challenging and building kids' endurance and resilience. BOUNCY & SOFT FOAM BALL. It doesn't make a lot of noise and kids won't get hurt or break things when play with it. LEARN BASKETBALL SKILLS & COLOR. Great for beginners and kids learning basketball skills, work well for students in the classroom and school.The rainbow color is eye-catching to children. ECO-FRIENDLY MATERIALS & SAFETY GUARANTEE. Made of 100% Polyurethane(phthalate Free),not poisonous PVC or cheap rubber. Pass SGS Test and European Standard EN-71 Test specifies safety requirement for kids toys. If you have any questions about this product by Chastep, contact us by completing and submitting the form below. If you are looking for a specif part number, please include it with your message.